There are more and more threatening signs that the winds of change may soon blow shut the window of opportunity for the Gospel that we have enjoyed since the Iron Curtain fell about 20 years ago. To sign up for the free GNS Newsletter just scroll to the bottom of the page. The newsletter is mailed two times per year. Special issues, or letters, are sometimes sent to report on breaking news. Each issue includes "God's-news-behind-the-news" from Ukraine , Moldova, Romania and other Eastern European countries along with a note from our founder and director, evangelical Christian Brother John. 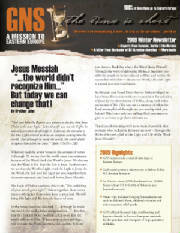 Urgent prayer points for our brothers and sisters in Christ are also listed in each issue. The Lord shows our teams many special needs from some of the poorest-of-the-poor as they travel through Eastern Europe. These include single moms, widows, and pastors in homes that are in danger of collapsing; have large, see-through holes in the roof; missing windows and doors; no access to clean drinking water etc. To sign up for your free subscription to the newsletter, ask a question, or refer a friend, send us an email, using the forms below. Or, send your name and address (include zip) to: GNS, P.O. Box 114, Middlebury, IN 46540-0114.